I am shattered. Since the strange disappearance of Harold and Charmaine my workload has increased exponentially… quite frankly I didn’t know that colouring-in could be quite so tiring. Plus, I have been overwhelmed by the desire to send ALL my blog posts manually. Who knows why??? ….oh…. and don’t I have to do something with ten rolls of tin foil???? 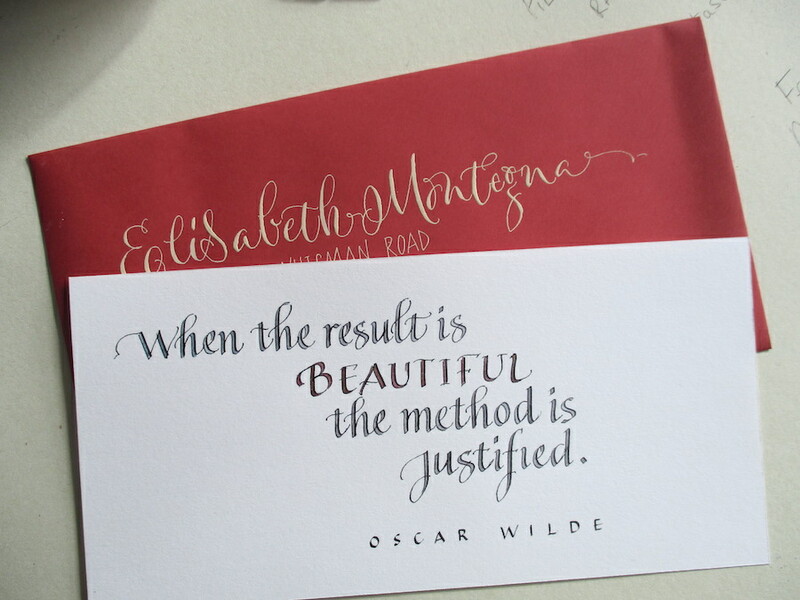 This entry was posted in Calligraphy and tagged calligraphy envelopes uk, italic calligraphy, italic uk, modern calligraphy, modern quirky calligraphy uk on September 24, 2015 by Scarlet. Maybe some time can be saved by handing off the posts to the Town Cryer to read? PS: I am having a panic attack about the tin foil! I had such big ideas for my tin foil this year…. but now they seem to be in tatters. The Welsh became quite aggrieved when I tried to wrap Snowden (the mountain, not the man)…. sigh, I may have to set my sights lower. Thank you, Mr Lax! I love your penmanship. Or penwomanship. Or should that be penpersonship? Anyhow, maybe I can be a pen mistress?? Thank you, Ms Roses! I’ve had that sort of warning from WordPress… I’ve also been warned that the whole of WordPress isn’t safe! Never mind. Blog rolls are obviously the way forward! Thank you, Mr Ducks! It’s not safe if Miss Scarlet has her nibs pointed at you. …..or it her tittles are on the warpath…. Nice to see you, Ms Mistress. This is a nice “grotesque” on the envelope (or how ever you professionals call it). As IDV assured me there is plenty of time, weeks until this dreaded “deadline” looms, so enough time to get creative, tin foil wise ! Thank you, Mr Mags! It is true, I am in a grotesque mood and it has manifested itself on my envelopes… maybe I will practice my bastarda on my next batch and become a grotesque bastarda aficionado? The deadline looms, as ever. Thank you, Ms Carte! This is a mighty fine idea… you have fired my imagination… I will await a good stoking. Oh, blimey! A fried hard drive, a couple of days without a computer and now a brand new, shiny laptop and I’m mizzled.Or any other word you can think of for being in a state of muddle and confusion. I was going to ask you about the green Elf Shorts and now I find it’s all tin hat stuff. But before the hard drive caved in, Ziggy said he’d done a nifty bit of whisker-twitching and thought he might be getting a signal from Harold…. The colouring-in is very soothing. Dear Dinah! Those shorts are in Australia! No longer my responsibility. Prinny is probably refashioning them as I type… I foresee a pirate influence with a trimming of chargrilled kangaroo. I have given up on Harold and Charmaine – last seen stencilling a fake Banksy on the post-box outside the sweetshop in Slack Bottom [Yorkshire]. Oh to be in Manhattan, Monsieur Pain…. or at least drinking one. Today I would like to be an American. I am fed up with being British, and stiff. Today I would like to be loud and wear inappropriate slacks. Tomorrow I fancy being an Italian with a full repertoire of hand gestures and an extensive knowledge of pasta. You should NEVER pine to be American. Haven’t you been following our ongoing, never-ending presidential election? It’s awfully embarrassing. I admire your drive and dedication (looking at the calligraphy, I think perhaps my name should be changed to Mr Slapdash). But manual posting? It’s an awful long way round everyone to hand-deliver, surely: what about a pigeon or two? And in the blogosphere, tinfoil is for hats. Just sayin’. My hand delivery is my speciality, Mr Auty!! And worth waiting for. Gosh! Who mentioned the FGES! I’m afraid they have escaped from the preserving jar and have secreted themselves somewhere in my fabric stash… seems like a good reason to sort the stash and find the pesky pants… First the tinfoil hat compo in October… Then the FGES compo in November… How’s that sound to you darling? Yes, Prinny, this seems like an excellent idea! We will all need cheering up come November, when the leaves will be stripped from the trees as Somerset struggles beneath 6ft of water. Ooh, yes! A FGES encrusted November! Yay! Seems an old song is always lingering just below the surface while I blog. Your first line had me playing “Shattered” by the Rolling Stones. 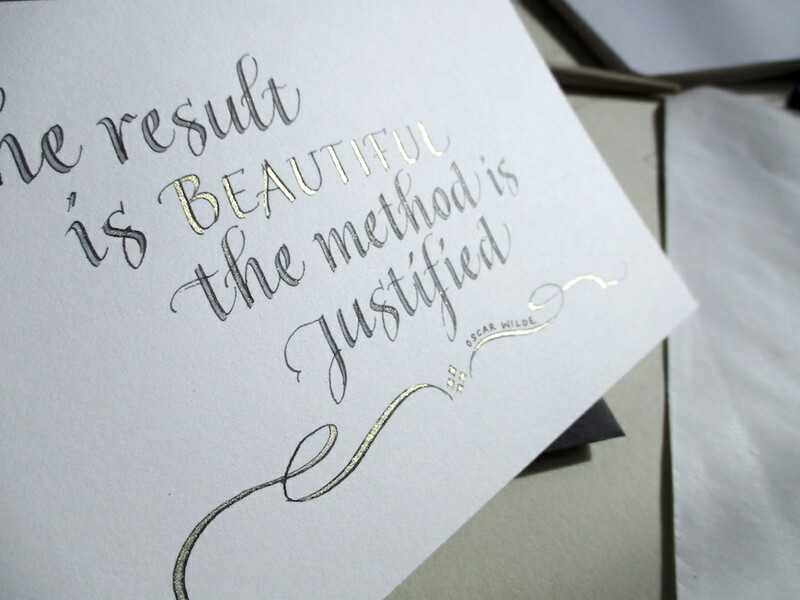 Crikey, Bill, it looks like this simple calligraphy post has gotten everyone singing! I am not sure I agree with Mr. Wilde this time ’round. 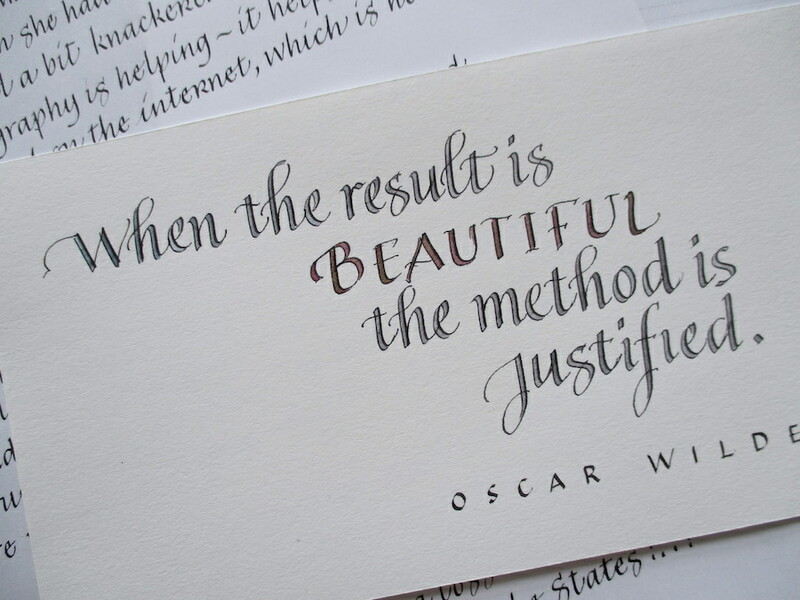 The imposition of upon me of another person’s idea of beauty regardless of the method frightens me. There are some who maintain that the New York City skyline is much more beautiful without the Twin Towers. Innit? Yes, one week until the Tin Foil Top Hats and Tiaras Competition deadline! There’s still plenty of time. If it makes you feel any better, I haven’t started (or even got an idea for) mine, yet! I have nothing to say about tin foil. I also have nothing to say about frogs’ legs or chinz curtain material. But I was sad that the log lady has finally left us. Are you still doing it all by hand, my dear ? I have commented on everyone’s blogs and will be posting them via Royal Mail at the end of the week. No need to harness the horses, but I am only glad to receive a vital signal from you ! too bad Western Union telegrams are not available any longer. Dear Bill, who needs a to send a telegram when there is a loft full of pigeons with nothing better to do than wing their way to America. Please do not make a pie out of them when they arrive. Please send any correspondence via Message In A Bottle. Has the bottle not reached you yet? Oh good heavens…! I threw it out to sea a month ago… what is going on?? Darling – ? Are you still doing it all by hand ? I haven’t been here for ages…. it doesn’t look right… what is going on with my fonts…? Here is a link to a treasure trove. And as interesting as it may be in itself, even more interesting is how the letters were folded. Here’s a youtube about this, and further stuff about the treasure trove. Shellack anyone ? FYI: Bicycles in Pantone colors! I kiss your feet and will answer soon ! I take it that you have received my manual offering?!! Your manual offering made me very happy ! It came on to me yesterday and had a real impact. I will find a way to answer digitally over the coming days – right now I’m just too knackered for anything that involves fanciful, imaginative and swell handiwork, too sorry m’dear ! Tomorrow there will be some festivities, but then I will find the time to set my hand to answer your very promising manual offering with a proper work of love, hopefully colour~ & cheerfull ! And yesterday I found what I meant to send to you…. so, watch your postbox!! Ja, ist denn schon Weihnachten ? ! 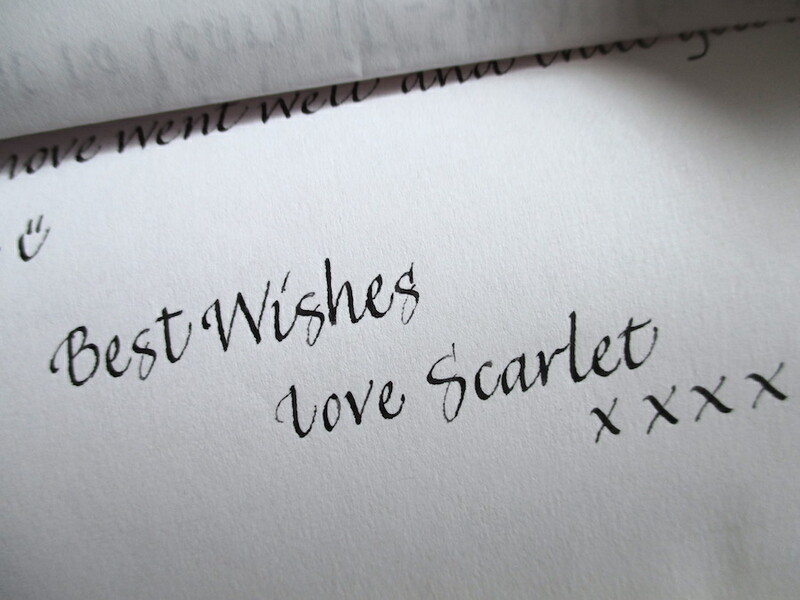 Yes, it is – Merry Christmas, dearest Scarlet ! Merry Christmas, Mr Lax!! Apologies… I have been a lazy mare lately! Merry Christmas, Ms Carte!!! I hope you are safe and dry (in a good way!) and apologies for the delay in my response. Happy Holidays, Scarlet & loved ones. Hopefully, this third attempt to leave a comment makes it through…If not, well, then best wishes and a joyous Holiday Season to you and yours. Perhaps the Xmas tree design in the post was too much. May the holidays surround you with warmth, love, and joy. And may the New Year bring you good health, good luck, good company, & good times! Cheers! Playing the fairy atop the Christmas tree will do that to you…. Merry Christmas darling… Oh… and it’s almost the New Year… do you require tweezers for the tinsel removal? Merry Seasonal goodies to you, Ms Prinny!! Laundry tongs ?? The tools of the domestic cleaning chores often baffle me. Well at that is the excuse I offer. That and I can’t find the “blank”.